Ladies, we’ve all been there. You have a day of heavy barbell work planned but surprise surprise, your monthly visitor showed up early. Regardless if you’re a female or know a female, you know how much of a pain (literally) a woman’s period can be. A woman’s menstrual cycle plays a key role in a number of different parts of the body. If you’re a female athlete, you know what it’s like to be preparing for an intense training session only to wake up that morning in a funk with different moods, cravings, fatigue, tender breasts and possibly a bit of depression. These hormonal fluctuations are no joke. The start of your menstrual cycle (or the first day of menstrual bleeding) begins with the follicular phase. At the start of of this particular phase, the lining of the uterus is thick with fluids and nutrients in order to properly nourish an embryo. This phase lasts for about 14 days. This phase varies the greatest in length. During this phase the pituitary gland increases production of follicle-stimulating hormone (yes, that is the name of the hormone). This hormone stimulates the growth of up to 30 possible follicles (each follicle containing an egg). As the phase continues on, this hormone decreases and only one follicle (called the dominant follicle) continues to grow. The dominant follicle will begin to produce estrogen while the other follicles degenerate. The estrogen produced from this follicle is what stimulates the luteinizing hormone released at the beginning of ovulation. So, for women trying to get pregnant, when does the ovulation phase actually start? Well, the buildup of the luteinizing hormone is what really triggers the start of this phase. The hormone stimulates the dominant follicle to bulge from the ovary, causing it to rupture and release an egg. The phase lasts anywhere from 16 to 32 hours. The release of the egg (up to 12 hours after release of luteinizing hormone) signals the end of this phase. In the luteal phase, progesterone increases core temperature and causes the body to lose sodium. This is especially important to note since us ladies already have a lower water content in comparison to our male counterparts. The luteal phase is the phase of the menstrual cycle that begins after ovulation (after the egg release). It starts here and ends the day before your next period. During this stage, both the luteinizing hormone and follicle-stimulating hormone levels decrease. What Role Does the Luteinizing Hormone Play? Well, luteinizing hormone is produced in the pituitary gland by gonadotropic cells. The rise of the hormone is what triggers ovulation in the first place. After the release of the egg (ovulation), the ruptured follicle closes and creates a corpus luteum which produced progesterone. The corpus luteum develops in an ovary and causes the uterus to thicken more from progesterone and estrogen, but degenerates after a few days unless a pregnancy has begun. Once the corpus luteum sheds, it stops producing progesterone, estrogen levels decrease, the lining sheds and menstrual bleeding occurs. This is the start of a new menstrual cycle. If the embryo is implanted, the cells surrounding the embryo start producing a hormone. Our female biology is a pretty complex subject, huh? How Do These Phases Affect Your Strength? So as a female strength athlete, how do these phases play a role in your strength cycle and overall physical performance? Some research studies have found that the follicular phase provides the greatest environment for optimal strength gains in comparison to the luteal phase (the last 14 days before your period, after the ovulation phase). (1) Some women even claim to experience more strength gains during this first cycle. One study showed that isometric force was significantly higher in the follicular phase vs. the luteal phase. This is most likely due to the variation of hormone concentrations -- specifically the higher concentrations of total testosterone and free testosterone available during the follicular phase. So what could this mean for your training cycle? When is the Best Time to Make Gains? As women, our bodies are physiologically changing almost every week. This could lead to inconsistency in your gains and your energy levels. 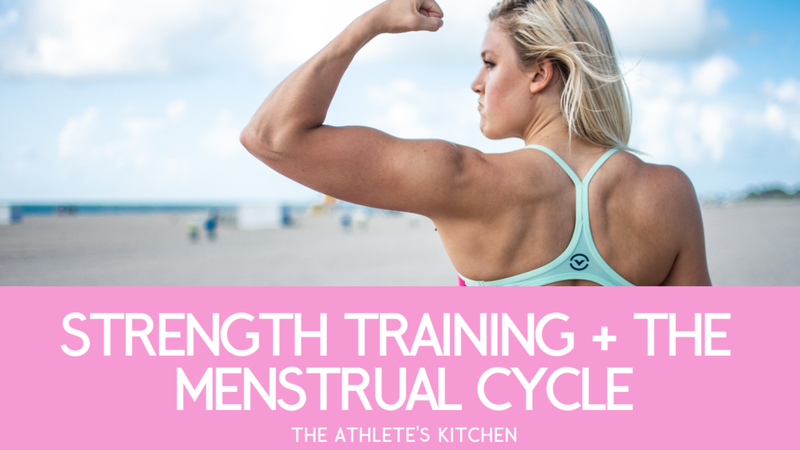 So planning your strength cycles based around your menstrual cycle could actually show tremendous benefit for females trying to gain strength and muscle or even looking to hit that next PR. As far as your luteal phase goes, it would be more productive to focus on good reps and maybe incorporate a bit more endurance instead of trying to go for a heavy one rep max. Who knew you could actually use your menstrual cycle to your advantage? These hormonal changes that occur during a woman’s cycle also could play a role in potential injuries. Surprisingly enough, the rise in estrogen before ovulation could lead to a higher risk of tendon injury. In comparison, the luteal phase (the phase after ovulation and before your next period), you are less susceptible to injury. (2) If you’re one to rush your warm up, be sure to spend the necessary time on these activating exercises, especially during your fertile phase. During the luteal phase, your progesterone levels are significantly higher. But what does progesterone do, exactly? Progesterone is produced mainly in the ovaries and prepare a woman’s body for a potential pregnancy. However, it’s also been shown to be extremely important in the proper function of the nervous system. It plays a part in promoting the growth and repair of myelin sheath, the white fiber-like substance that protects nerve fibers. With all this progesterone, your body may not feel as recovered during your luteal phase. In regards to your performance during the first week of your follicular phase (when you actually have your period), these are no doubt some of the more uncomfortable days of the month. You’re constantly bloated, cramping and a good chance of a breakout on top of that too. How Can You Counterbalance These Symptoms? If your program calls for a one rep max or high volume during the follicular phase, this is the time to go for that PR or push yourself a little harder than you typically would. During ovulation and the luteal phase, your body is less susceptible to these gains and you may find it more beneficial to sticking to more endurance-based metcons or lighter technique work. While you may want to be sticking to your program and pushing yourself to your limits, listening to your body is just as (if not more) important. Regardless of what your performance goals may be, coordinating your menstrual cycle with your training program could be the change you need in order to break through your plateau and start seeing some serious improvements in your strength and body composition.